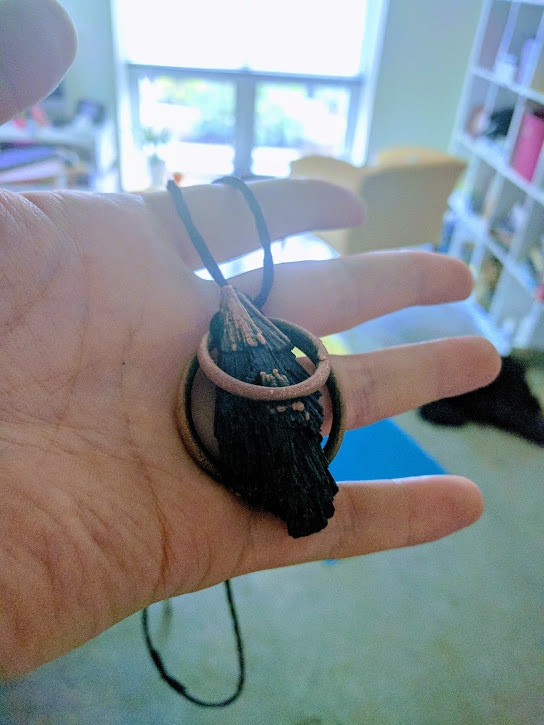 This is my talisman/athame/swiss-army-what-have-you of Black Kyanite & Copper. Either worn hidden on the left or right around my neck at heart-center. Hardly a day goes by without this. 3" length. 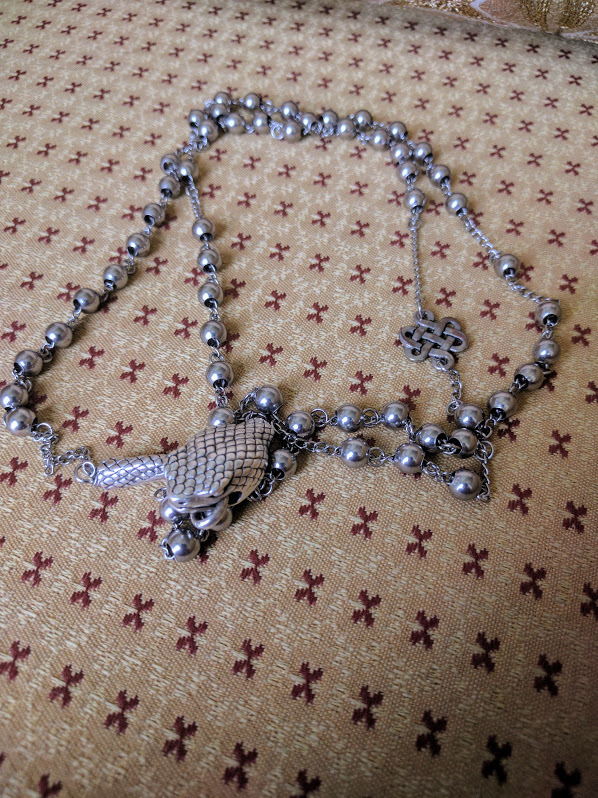 This is my prayer/mantra necklace of Silver & stainless steel (see iron.) I love the clasp, it's a snake biting it's own tail. I wear it when I go out in public as its a wonderful ward. It also makes me feel just a little on the closed-off side. So I consider my options. 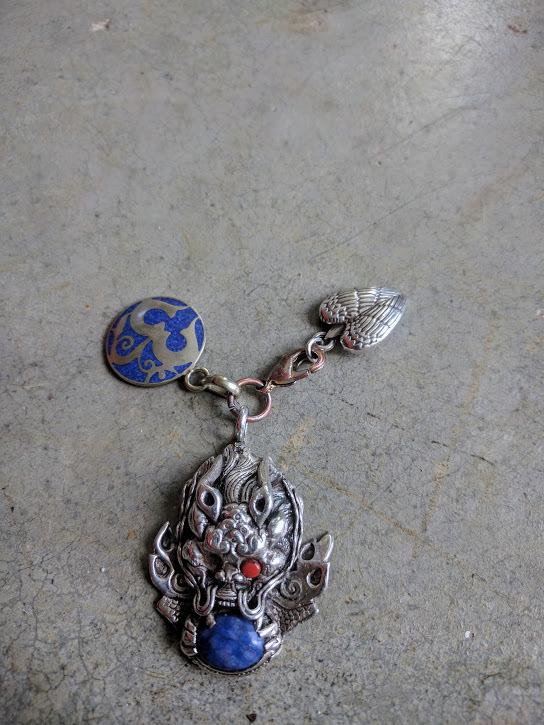 This is an amulet of silver & Lapis Lazuli I hodge-podged together. 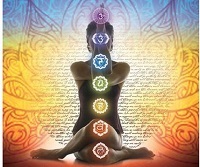 I love that the silver acts as a reflection of the Lapis Lazuli & what's left of the coral. Ooo. lovely charoite, or chariot as the spell check insists . Thanks for sharing the photos. It is always a treat. I have a lump of found red Jasper I cleave to for comfort, and a polished labradorite palm stone... ... Oops, lost in crystal thrall. You'll understand. Ooof Red Jasper. I would cleave to it for comfort too! It's so stabilizing & warm! And Labradorite, I've been fascinated by that one since I was a little kid. I believe it may even have been one of the first five stones I bought from a crystal shop after saving up my allowance. It was always so magical to me. It reminded me of Dragons for some reason; to wit I was also obsessed. The first time I saw lab. I had just entered a shop and literally saw a flash of light from behind the counter, 30 feet away. So of course I made a beeline over & asked what they had stashed. I was handed a basket of stones and took 1st pick of the litter. Treasure! 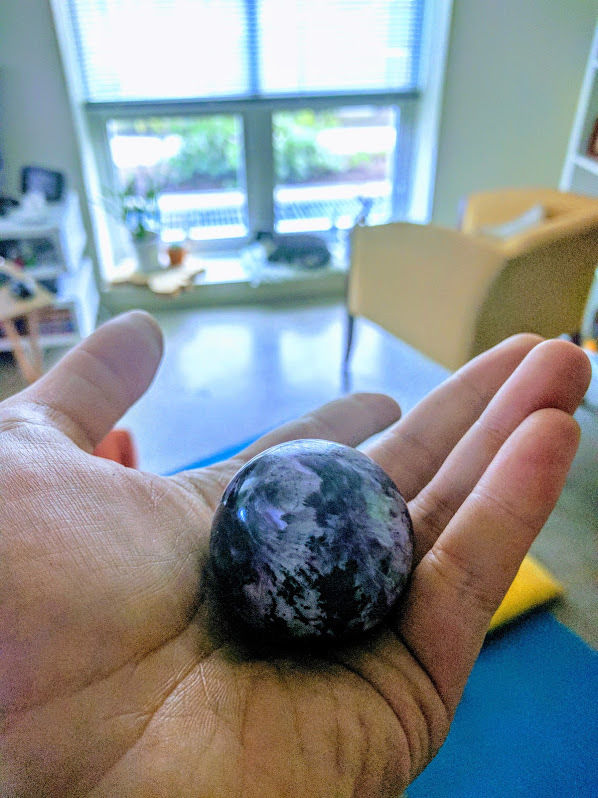 My first brush with charoite was when I was pawing through a basket of sugilite, and up popped an irredescent purple-feathered stone, obviously in the wrong bag from the original supplier as there was none of it in the shop, & obviously it was what I was poking around for. The shop clerk didn't know what it was, but I bought it anyhow and found out later. Oh yea, it's a ni-ice stone. Gee, I love rocks. 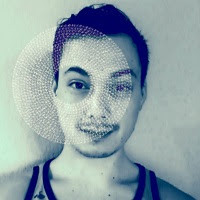 vassal, are you a photographer? You quite the eye. Thank you I'm not a photographer but I've always a knack for aesthetics or presentation! My most important crystal is the Herkimer Diamond because they have the attribute to entangle with other Herkimer Diamonds where ever they might be. I have one on my wand and one on my staff and sent one to my grand daughter in Denver to potentiate a psychic link with her. I've sometimes found myself browsing for Herkimer online. I need to go to a good shop nearby and see if they have any to touch. Many Witchy shops sell Herkimer Diamonds nestled together and with a sprig of White Sage as a pair to potentiate entanglement. 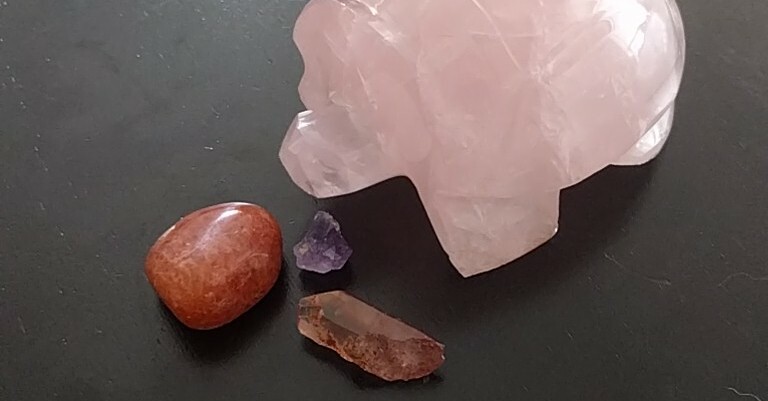 Very excited as I also received some free blessings in the form of amethyst, tangerine quartz & sunstone. 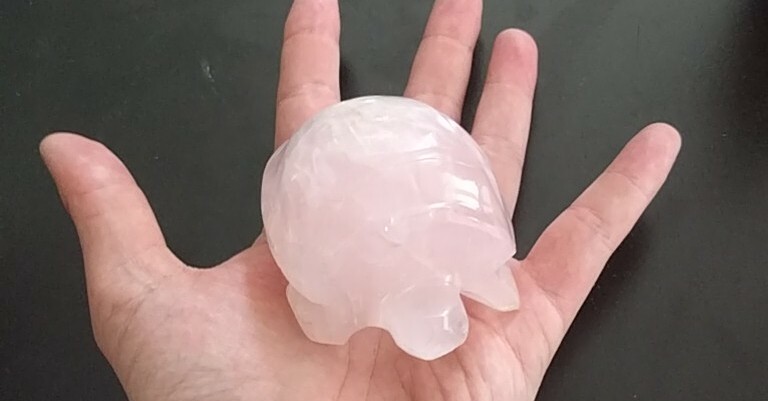 I just adore my new Rose Quartz Turtle! Pausanias: In the temple is the image of the goddess whom they call Ourania; it is made of ivory and gold and is the work of Pheidias; it stands with one foot upon a tortoise (the tortoise was a symbol of domestic modesty and chastity).